Streets is selling a new ‘Finding Dory’ ice cream in Australian convenience stores and supermarkets. The ice cream is being launched alongside the children’s Disney Pixar movie of the same name. The ice cream is in the shape of the Dory fish character from the movie and consists of vanilla and bubble-gum flavoured ice cream. Streets said that it decided to launch the ice cream after its success in 2015 with its ‘Olaf’ ice cream, inspired by the children’s movie, Frozen. Within its opening weekend, the Finding Dory movie made revenues of AUD $136.2 million, making it the highest-grossing animated debut. It is the sequel to the 2003 movie, Finding Nemo. 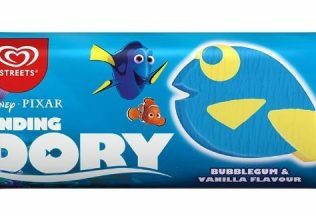 Streets Finding Dory ice cream can be purchased now from convenience and supermarkets across Australia. The recommended retail price for a single ice cream is AUD $2.00 and a six pack can be purchased for AUD $5.99. The Streets brand is owned by Unilever.